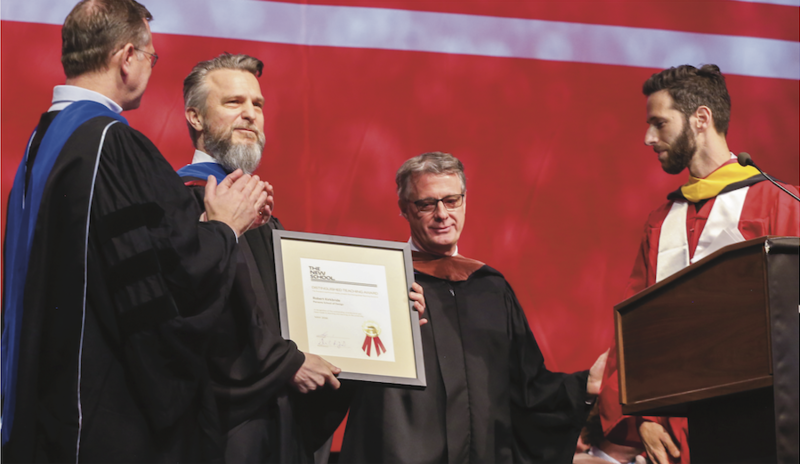 Every year, the university recognizes a group of faculty members who have been nominated by their students and colleagues as Distinguished University Teachers. These faculty members embody the highest standards for teaching and advancing The New School’s mission and vision through their remarkable capacity to inspire critical engagement with ideas and with the world. Recipients of the Distinguished Teaching Award demonstrate recent and sustained excellence in teaching. Their teaching exemplifies The New School’s mission: to prepare students to understand, contribute to, and succeed in a rapidly changing society, and thus make the world a better and more just place. Robert Kirkbride has continuously supported the School of Constructed Environments and university’s goals through clear pedagogical practices, assignments and assessment methods, and supporting students’ success. SCE is extremely proud and excited to share this wonderful accomplishment with Robert.